This post isn't an easy one for me to write. I've been mulling it over for months now. I really want to share from my heart, and that isn't always easy for me. This journey of parenthood gets increasingly harder as the kids get older. I'm discovering that most of what I thought parenthood would be like for us is not in fact, how it actually is. This is not a bad thing at all, it's just impossible to know what is best for your children, years in advance. What's best for one family or child, is not always what is best for another. Even the ways Tony and I were raised are not necessarily the best way for us to raise our children. Tony and I both had great parents who raised us how they felt was best. Our parents are human, so I think it's safe to say, without any disrespect to them, that their parenting wasn't perfect. No parent is, or will be. However, they raised us as they felt led from God, and most importantly they raised us with a firm foundation in God and love for Him. That makes them excellent parents. When we choose to do some things differently in raising our children, we are not trying to disrespect our parents, or say that the way they did some things were wrong. We are simply trying to follow God's lead in how best to raise the children that He has entrusted to us. Tony was raised a military brat. His mom is a teacher. He has moved around frequently his whole life. He has attended public schools, a DOD school, private Christian schools, and was home schooled his last last year or so of high school. I, on the other hand, lived in the same area my whole life (with the exception of 6 months we lived in Kansas). I was home schooled my whole life. Very simple and sheltered. Because I was home schooled my whole life and was taught that public school was bad, I just naturally planned to home school my children. Natalie started school while we were living in Hawaii. Hawaii public schools are...well, not good. Most of them are not air conditioned, and not a fully enclosed building (the halls are outdoors). The education is not great, and non-local kids can be bullied quite a bit. So for Kindergarten and first grade, our decision to home school was an easy one. One child, an hour or two a day for Kindergarten, piece of cake. For first grade we continued. Then Savannah was born and grew into a toddling baby/toddler. Gabbie got interested in doing some school also. Even though learning was easy and she is super smart, Natalie wouldn't stay focused. She wouldn't do her work unless I was sitting next to her, coaching her. Gabbie wouldn't wait for me to help her with her work, she'd just take off with how she thought it needed to be done. Savannah would get into stuff. She needed the attention that is typical for a 1 year old. Yet first grade took longer than nap time lasted. Gabbie didn't nap. Natalie hated school. I hated trying to make her do it. I was constantly nagging her to hurry up and do her work, stay focused, etc. We didn't enjoy each other. It was a mess. By this time baby #4 was on her way and our time in Hawaii was coming to a close. We were praying and seeking God and His will as this next chapter of our life was approaching. We got assigned to Virginia, which happens to have very good public schools. We were prayerfully evaluating how our children would be educated in the near future. At this time, I am not called to be a teacher. I don't enjoy it, or all the "extra" stuff that goes along with it. I'd rather just get it over with and be done. And I don't enjoy, nor am I good at, the hands on, play type learning either. I don't want my girls to feel the same way about school as a result of me being their teacher. I also feel that the younger two girls are not getting the attention and interaction from me that they need at such a young age. Now that Natalie is going into 2nd grade, school definitely can't be done just during nap time. I feel that in order for me to give the little ones the attention they need, the education of the older two suffers. That's not ok with us. Tony and I feel that God is calling us to send the girls to public school this year. The school is on the military base where we live, and it's just for the kids that live on the base,which keeps it from being overly big. That also means it is in a guarded, gated community. It is about a mile from my house, and I can see the bus stop from my kitchen table. Which means that I don't have to get the little sisters out early in the morning or during naptime to drop off/pick up from school. I was raised with a very negative view of public, and even Christian private, schools. So this is obviously a decision that most, if not all, of my family disagrees with. I've had to seek God in this area a lot! The fact is, I know lots of wonderful people that have done great things for the kingdom of God that went to public schools. They never went through a wild or rebellious stage. I also know several home schooled kids that have totally rebelled and their lives now don't reflect their upbringing. I know of some that made some very unwise decisions almost as soon as they graduated and no longer were under the strict control of their parents. Home schooling your children does not ensure that they grow up with a fear and love for God. That comes from their heart, and you can influence their heart at a young age, even if they are not home schooled. Parents cannot-and should not-try to isolate their children totally from the truth about sin and the subtleties of temptation. We should not cultivate the kind of "innocence" in our children that leaves them exposed and vulnerable to temptations they never even imagined existed. Our task is to teach them discernment, not raise them to be prudes. Throughout the book of Proverbs, the naive ("simple" in many translations) are held up as negative examples. We definitely want our children to have a holy innocence, but we feel that simply isolating them and cultivating naivete` isn't the way to go about that. Even if your child goes to public school, you as the parent still have the greatest influence on their lives. It is your responsibility to be good stewards of that. Going to public school will in no way alter my children's relationship with God in a negative way. As their parents, Tony and I are -and plan to continue to be- very diligent in carrying out Deuteronomy 6:6-7. Two great books I have read recently are What the Bible Says about Parenting by John MacArthur, and Going Public by David and Kelly Pritchard. Going Public is about how your Christian child can thrive in public school. I highly encourage both of these books. I think anyone who has a child in public school should read Going Public. Or even if you are considering it. It resolved a lot of my misconceptions about public school. I don't believe that public school is right for every family, just as I don't believe that home school is right for every family. Some parents and children should not home school. Right now, we fit into that category. However, just because we feel God is calling us to put the girls in school this year, does not mean that they will for sure go to public school every year. It is a constant area of prayer and evaluation. Someday God might call us to home school again, or maybe private school will be an option. We are just trying to be open and in tune to wherever He leads us. We are all very excited for our new adventure this fall! The girls get to ride the bus to school, and experience life away from each other for a few hours each day. It will hopefully be a little quieter around here for a few hours during the day when daddy is trying to sleep after working all night. I get to focus on the babies of the family for a few hours each day- teaching colors, shapes, ABC's, and all the other baby/toddler developmental and behavioral stuff. After moving here and making the decision to put the girls in school, I have been presented with the opportunity to be involved in some Bible study leadership and women's ministry. I'm still praying about where God is leading in this area, but I'm excited. I'll keep you posted. Even though we still choose to home school for now, I respect and support you in your decision. Enjoy the next year! I'll be praying for you. As our kids were growing up and we moved from place to place, we had to revisit the decision about where to send them to school each time. And, sometimes, we had to revisit those decisions even between moves. They all made it through with a bit of experience from all kinds of schools! Keep doing what you're doing. God will faithfully guide you. After all, He loves your kids even more than you do. Blessings! I am a wife and mother. I have been married for 8 years. We have four little girls. 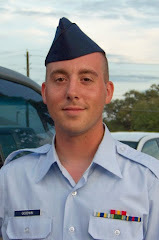 My husband Tony is in the United States Air Force. 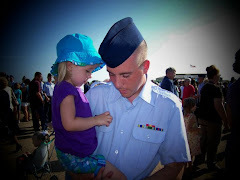 We are currently at our second Duty Station, Langley AFB, VA. Before this we were blessed to be in Hawaii for 3 years. God and family are the most important things in my life. If we follow God I know that we will be just fine in our crazy life! Let us begin our journey.. Broken, and a cast doesn't heal this one..